A warning about a massive earthquake off the coast of California has been sent 92 years late. 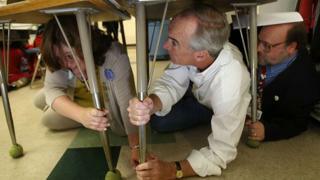 A computer error caused the US Geological Survey (USGS) to issue the false alarm about the magnitude 6.8 quake. The quake actually took place in 1925 when it laid waste to the city of Santa Barbara and caused 13 deaths. In a statement, the USGS said its computers had "misinterpreted" data causing the alarm to be wrongly issued. News organisations across the US received the emailed alert about the quake which, if it had been real, would have been one of the largest ever recorded in California. Few organisations reacted directly to the news because it was dated 29 June 2025 - exactly 100 years after the actual event took place. The LA Times, which uses AI-based software to automatically write up the USGS alerts, did issue a news story based on the alarm notice. The federal body said work it was doing to revise and update information about where the historic quake struck had caused computer systems to misinterpret the data and think it was seeing a novel event. It apologised for causing any alarm and said it was "working to resolve the issue". The 1925 quake is classed as a level seven-to-nine event on the intensity scale used by the USGS to measure the damage done by earthquakes. At the higher end of this range, the quakes would cause "considerable" damage even to structures designed to withstand tremors, bring about a partial collapse of substantial buildings and make many buildings shift on their foundations.